The "kraft process" (also known as the sulfate process) is the method to convert wood chips into pulp and then to cellulose fibers. This is done by mixing the wood chips with sodium hydroxide and sodium sulphate, soaking, cooking and processing. 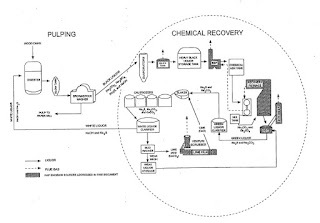 One reason why the kraft process dominates the paper industry is because of the ability of the kraft chemical recovery process to recover approximately 95 percent of the pulping chemicals and at the same time produce energy in the form of steam. 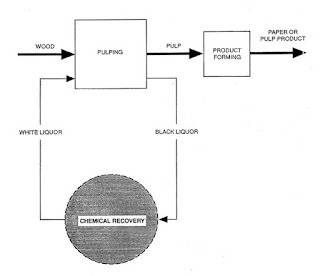 The purpose of the chemical recovery cycle is to recover cooking liquor chemicals from spent cooking liquor. 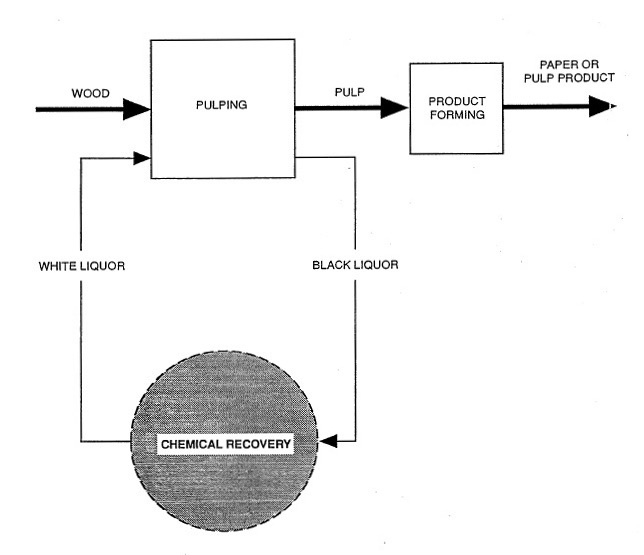 The process involves concentrating black liquor, combusting organic compounds, reducing inorganic compounds, and reconstituting cooking liquor. 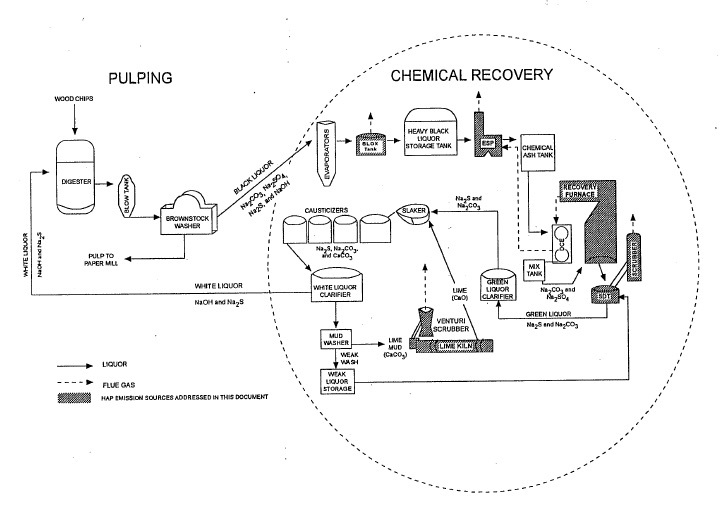 Chemical recovery process flow diagram. Green liquor is created when molten inorganic salts, referred to as "smelt," collect in a char bed at the bottom of the furnace. Smelt is drawn off and dissolved in weak wash water to form a solution of carbonate salts - known as green liquor - which is primarily Na2S and Na2CO3. Green liquor also contains insoluble unburned carbon and inorganic Impurities, called dregs, which are removed in a series of clarification tanks. Decanted green liquor is transferred to the causticizing area, where the Na2CO3 is converted to NaOH by the addition of lime (calcium oxide [Ca0]). The green liquor is first transferred to a slaker tank, where Ca0 from the lime kiln reacts with water to form calcium hydroxide (Ca(OH)2). From the slake, liquor flows through a series of agitated tanks, referred to as causticizers, that allow the causticizing reaction to go to completion (i.e., Ca(OH)2 reacts with Na2CO3 to form NaOH and CaCO3). On the right you see a Kinetrol model 14 double acting actuator on a 8” full-port ball valve on a green liquor line. The valve cycles 2 times per day to direct green liquor flow and weak wash (weak white liquor) alternatively from one pipe to another in order to prevent solids build up in the pipelines. Equipment used to produce pulp, paper, and paperboard is exposed to a wide range of temperature and humidity conditions, and contaminants. Actuators used in Pulp and Paper manufacturing processes must withstand the most difficult operating conditions. Kinetrol actuators are preferred in these situations because they don't allow corrosive atmospheres to penetrate the actuator or springs, their long cycle life, and their epoxy stove enamel finish. 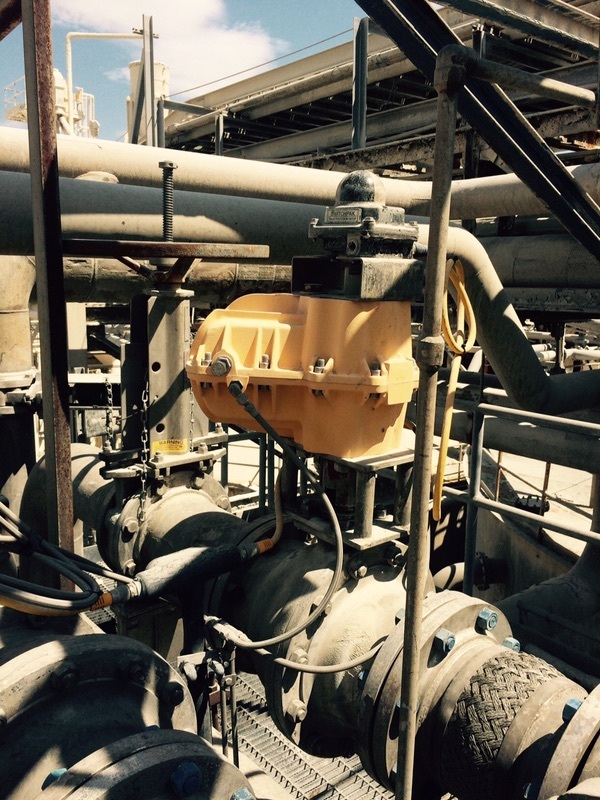 Contact the experts at Kinetrol USA at 972-447-9443 to discuss any pulp and paper mill actuator application.